I think this might be the first non-vegan recipe I have posted. It’s kind of scary to open myself to judgement as I switch to a non-vegan point of view. Historically this website has been totally vegan, though with the change a few months ago I decided to open the doors to no-vegan recipes. Personally I have gone through a process to make the decision to eat some animal products again, and it is a decision that works for me and my current lifestyle. When I do eat animal products I try to stay with “happy” animal products. I am working on a post about my food journey that will come soon. I continue to eat vegan most of the time, though when I do venture out of my vegan ways this is one of my favorites. 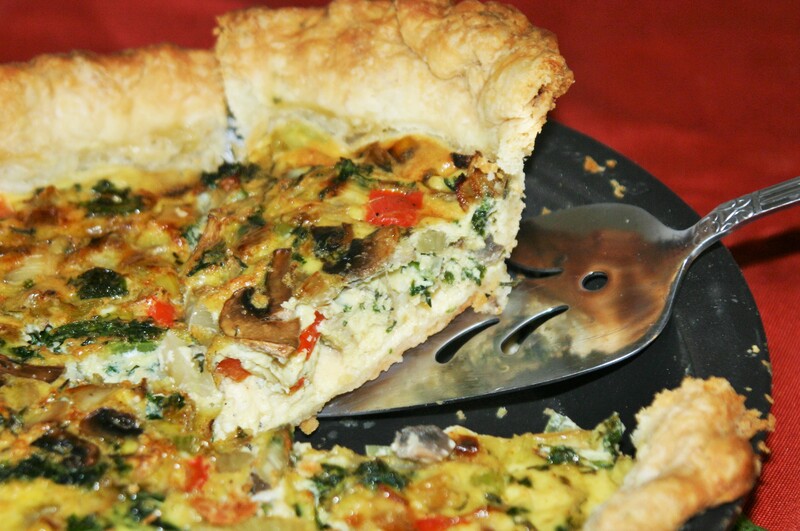 I think quiche is best when loaded with vegetables and baked in a perfectly flaky crust. Quiche is a dish that I have fond memories of from my childhood. We always had quiche for holiday brunch, and when we had people over for breakfast. It seems an impressive dish, but is actually easier than scrambled eggs! What I love about quiche now is easy it is to throw together, that it feeds lots of people without slaving over a stove or worrying about timing eggs, and you can put whatever you have in your fridge, making it a delicious way to use up odds and ends. The only “hard” part of quiche is if you are making a homemade crust, and I made this sweet video to take the mystery out of that, so you are all set. I guess you could also buy a crust, it is up to you. Beat eggs until uniformly yellow. Add milk, salt, pepper and whatever herbs and spices you are using mixing briefly. Sprinkle the cheese evenly into the bottom of the prepared, unbaked pie crust. Spread the cooked vegetables evenly over the cheese. Pour the egg mixture over the vegetables and cheese. Bake in the preheated oven for 45-60 minutes until a knife inserted in the center comes out clean. What is important for successful quiche? I I like to think of starting to build the flavor in quiche with the veggies accented by the cheese, herbs and spices, and all held together by the custard. Choose you vegetables based on either what you have, or a specific combination for a taste you are looking for. If it sounds like it would make a good omelette, it would make a good quiche. Really any vegetables will work in this recipe; you can use as many or as few as you like. If you only do a little you might need to add more custard to fill the crust. I like mine stuffed with vegetables. I love using greens such as spinach or kale, onions or something in that family (leeks, shallots, scallions), mushrooms, peppers, broccoli. Really whatever you like in the combination you like it. Somewhere between 1-2 cups of cooked vegetables per quiche. Vegetables are the first layer of flavor, so choose those that you like together, chop them and cook them before adding them to the quiche. I usually saute mine. When cooking the veggies you want to make sure they are just cooked as they will cook a little more as the quiche bakes. You also want to start building flavor here while cooking the veggies. I usually add salt pepper, and finish with some fresh herbs if I have them. Dried are also good, but I add dried herbs while the veggies are cooking rather than at the end. You can also use leftover cooked vegetables. Let’s say you had fajitas last night, chop up those leftovers and throw them in. Maybe it was steamed broccoli, or roasted asparagus; just toss it in. Almost any cheese you like should work fine here. Shredded is best as it will melt more evenly. Add the cheese to the crust first and it will help create a barrier so the crust doesn’t get soggy from the filling. Think about the cheese you might want on an omelette with the vegetables you chose, and use that cheese. Somewhere between 1/2 and 1 cup of cheese is good. You can also mix types of cheeses here. Fresh herbs are great in quiche, but if you don’t have them dried are fine. Don’t forget the salt and pepper! Season every layer separately (vegetables, custard, even the crust if you are making it homemade). I used thyme, sage, salt and pepper in my quiche today. Again, think of flavor profiles you like together and build a quiche based off those. Maybe basil and tomato with mozzarella, broccoli cheddar with just a little salt and pepper, mushrooms, spinach and swiss cheese with herbs de provence. Whatever sounds good. You need something that holds it all together, and makes it, well, a quiche. The custard does this. If you are using dairy milk 3 eggs to 1 cup milk works well, if you are using non-dairy milk then 4 eggs to 3/4 cup milk. Sometimes I add too many vegetables and have to whisk another egg and pour it over the top to make sure the veggies are covered in the custard mixture. Season this layer too; salt and pepper for sure, and a little bit of whatever herbs and spices you are using. Good morning Adrianne! I followed your recipe this morning. I used kale, leeks, spinach, mushrooms and green pepper. I also used fresh thyme, fresh rosemary, and smoked paprika. This is without a doubt the best quiche I’ve ever made! I am finding your blog to be a staple in our kitchen. Thank you so much for your time, your enthusiasm, and your wealth of experience as we attempt to focus on adding more vegetables to our daily intake.